Woking, Surrey c1930. The road on the left is Chertsey Road, to the right the High Street. 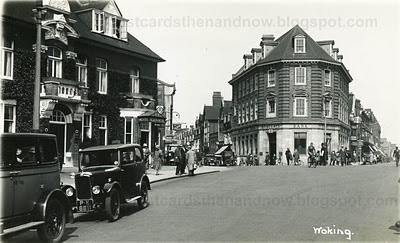 The hotel on the left, the Albion Hotel, is long-gone. The current building on the site is at least called Albion House. You can just make out a woman in the top window of the hotel. The modern canopy you can see on the Google Street View is part of the rejuvenated Woking Railway Station. The building on the right of the picture that was a Barclays Bank is now a Budgens convenience store. Postcard publisher not stated, but probably Charles Mitchell (1888 - 1961). A wonderful postcard, especially with the cars. I don't think the modern view is an improvement, in fact far from it. I hate to be overly sentimental for all things old and quaint, but I do sometimes wonder if we pay any attention to aesthetics at all anymore. I'm nowhere near from Woking, but I read about it in War of The Worlds. I love the older picture. I do agree with you. Nowadays, all sorts of architecture are mixed until nothing really means much anymore and also traffic lights and signs, ugly commercial stuff. This killed much of the pretty view all over the world. Ha! I did grow up in Woking and read War of the Worlds - I know many of the places (loosely) referenced. Funnily enough, I know live in Grovers Mill new jersey of Orson Wells' War of the Worlds radio broadcast fame. Know this bit of Woking well and love the then and now approach! I think the Albion Hotel was demolished in the '60s. certainly the first incarnation of the modern Albion House was erected at the end of that decade and the first occupant of Woking's first "skyscraper" was BAT. The canopy is turn of the century and I pass no comment. Next to Barclay's on Chertsey Road was a National Provincial Bank, and it was still Nat West at the end of the '70s when i went to see the manager to get a loan to buy my first decent car.